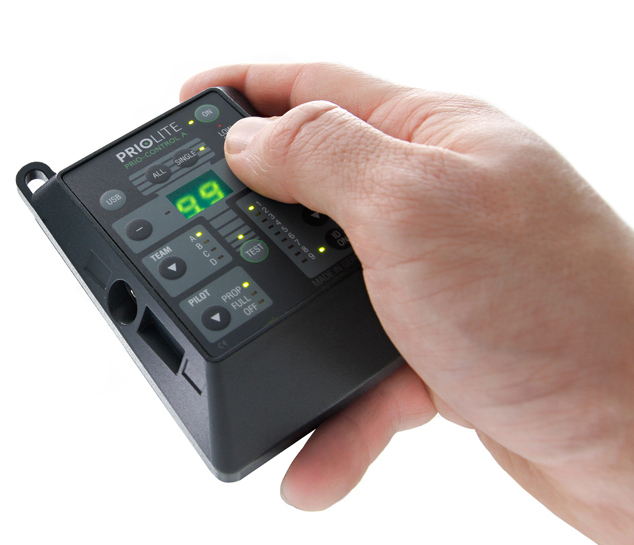 This radio control is compatible with all Priolite lights and works with standard AND HotSync strobes. 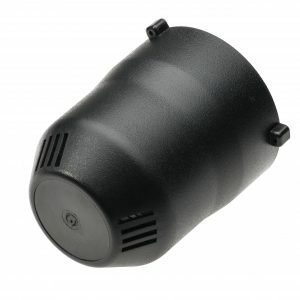 It sits on the cameraâs hot shoe and can remotely adjust almost all functions of Priolite lights. This remote lets a photographer organize lights in 4 teams (A-D) with 9 lights in each team. The bi-directionality of the remote control ensures that the power settings on the lights match settings on the remote control. When an assistant changes power on a flash, for example, this adjustment is transferred to the RC, and vice versa. The Test button of the radio lights up when the slowest flash in a team is recycled and ready to fire. Power settings can be adjusted either for each strobe separately, or for all strobes in a team at once. 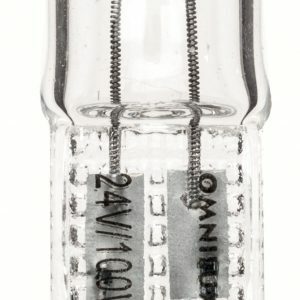 This is very useful when balance/ratios among strobes has to be maintained but the overall exposure needs to be adjusted. The right side of the remote has 2 sockets (3.5mm jack). 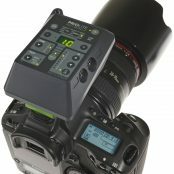 The lower socket can be connected to the sync socket of a flash, thus triggering even non-Priolite strobes is possible. 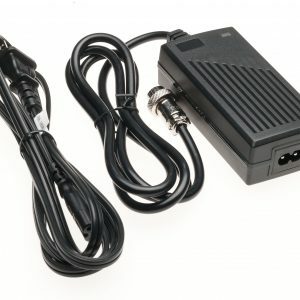 The upper socket enables syncing with cameras that donât have a hot shoe. Radio Control is powered by 3 AA batteries and operates at the frequency 2.4GHz. The working range is up to 1000 ft. This is the HotSync version of Priolite Radio Control for PENTAX. 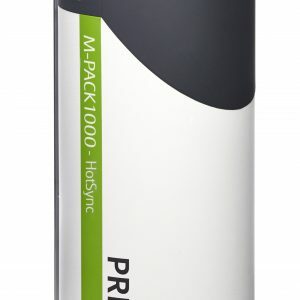 When combined with Priolite HotSync strobes (MBX 500 ULRA, MBX 500 HotSync, MBX 1000 HotSync, and M-PACK 1000 HotSync) synchronization up to 1/8000 sec. can be achieved. Please note that this HotSync version RC can be also used with standard strobes, but only with shutter speeds up to 1/200 sec. âHigh-powered strobe photography at shutter speeds of up to 1/8000th of a second, combined with the ability to operate any of the Priolite Hot Sync strobes at any power setting and without the need for an outlet, truly represents a quantum leap forward for all owners of Pentax cameras,â says Joachim Renschke, the CEO and founder of Priolite GmbH. 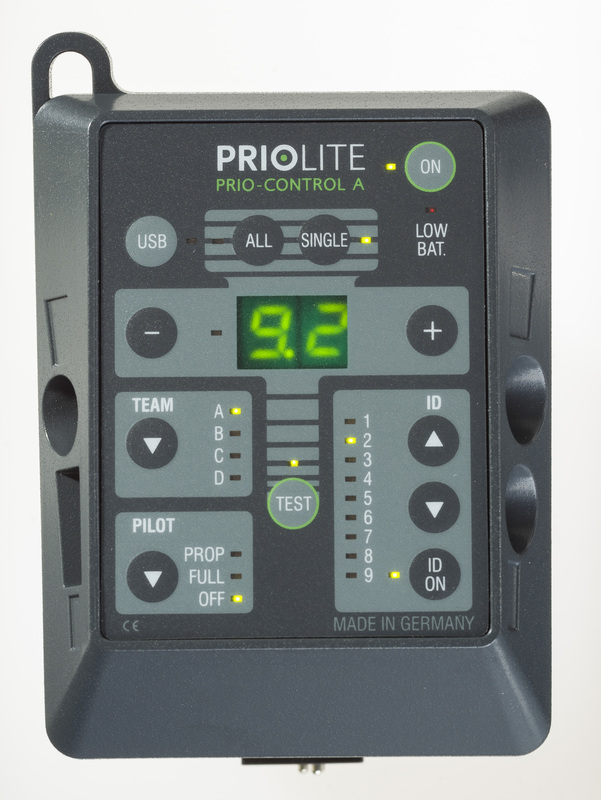 By using the 2.4 GHz spectrum, the Priolite Remote Control supports 4 groups, 9 different ID’s in each group, 1/10th of a stop power adjustments, and remote control of modeling lights wherever your next assignment might take you. 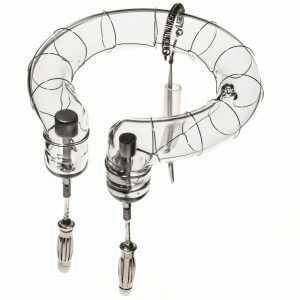 Photographers now no longer have to rely on generators while on location, searching for outlets, or running wires when setting up their lights. 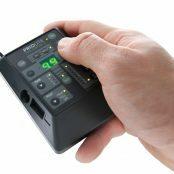 The RC-H/P is able to synchronize Priolite HS lights with the PENTAX 645z at up to 1/4000th of a second, and at any of the available power settings on the strobe. 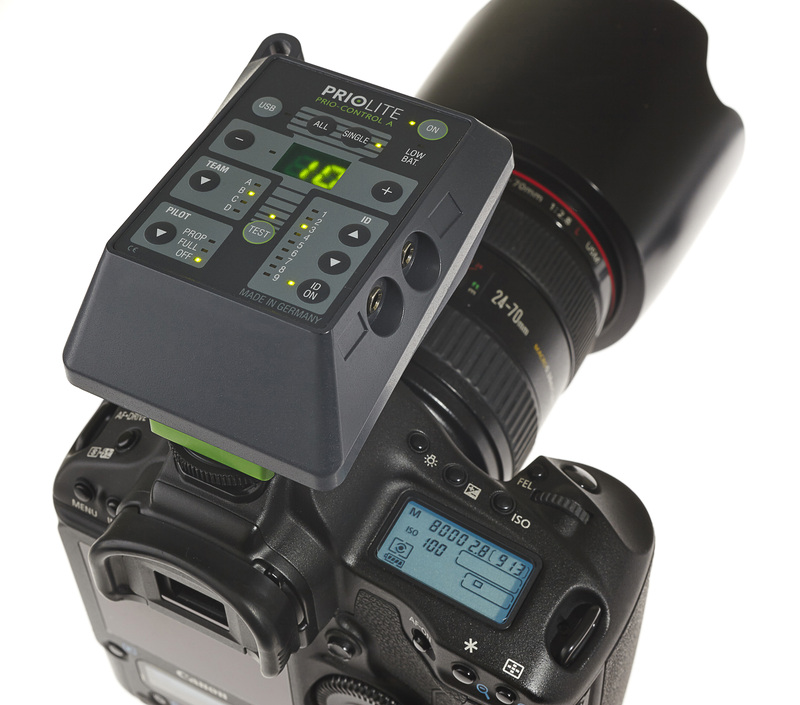 The Priolite HotSync Remote is available for Canon, Nikon, Sony, and PENTAX cameras.